Win A Smartfish Whirl Mouse! | OhGizmo! When you’re spending hours at your computer working on a research paper, you’re going to wish you had something a little more comfortable than the standard mouse that came with the PC. 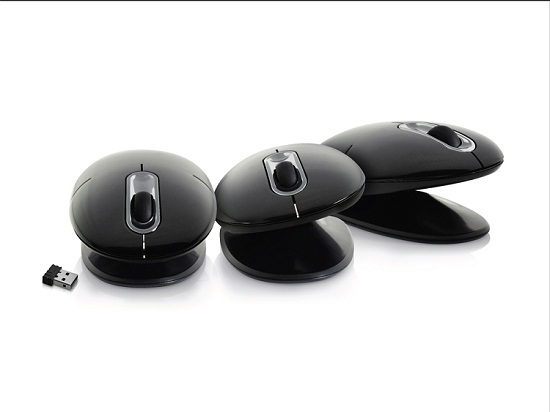 Why not get something that’s specifically designed with ergonomics in mind, like this Whirl mouse from Smartfish? Better yet, why not let us give one to you? We’re continuing our back-to-school giveaways this week by offering up three Smartfish Whirls. No, you’re not going to be greedy and get them all to yourself. What do you need with three mice anyway? Instead, we will pick three different winners and send a new Whirl to each of them. Just drop a comment below, and we’ll pick a winner this Friday. Good luck! ← Announcing The Winner Of The TimeCommand Giveaway! I keep looking and looking for a HID that will alleviate the pain in my wrist due to all-day mousing. I had yet to come across the Smartfish Whirl, and after giving the website a peek it definitely looks like it could do the job. Love to have one. Looks like a great way to sidestep mousing aches & pains. Don’t pick ME, don’t pick ME! Is what I’d say if you picked me. Would love to have one! Between my job and my personal web-wandering I am on the computer easily 12 hours a day. My wrist would be eternally grateful! I’m a designer who clutches his mouse at least 40 hours a week (more if you count at-home browsing!) This looks pretty sweet. i would be very interested to try one of these out. as a coder I use my computer waaaaayyyyy too much. This is just another reason to use it more. This would be pretty helpful! Poor college student who appreciates free things– pick me! Could really use a new mouse. Free things make me happy! being retired I don’t do much other than trying to surf fr interesting and/or strange news stories. Having had to replace my shoulder joints it is hard to use a mouse, hopefully this one would d a better job than the standard mouse, I can’t aford to buy a new one. My standard issue mouse is not cutting it at work. I’ve been needing a new mouse for some time! I’ve been needing a new mouse for some time! And this one looks… pretty cool! Something like this at work would be a great improvement! Sign me up. I’ve been needing a new mouse and the Smartfish seems pretty awesome. Sweet! Could use one of these ! This could replace the Ferrari controller i won but never got! A new mouse would be most welcome! That mouse looks like it’s about to chomp on something. I like it. New mouse would be awesome! I will give it a good test! Golly gee, these sure are neat. A new whirly gig? Sign me up!